LED dimming technology is becoming increasingly popular and sought after. It allows for flexible and versatile lighting applications for your home, office space, warehouse, classroom and more. However, there are still issues LED dimmers present, most of which are easy to address. From poor installation to non-compatible LEDs, let’s take a look at common dimming issues and how you can problem solve them. Dropping Off: This can occur when you are dimming your lights, but they suddenly turn all the way off. Popping On: The opposite of dropping off, this occurs when you are trying to raise the level of light, but it jumps to full brightness. Lack of Response: A lack of response means you move the dimmer switch up and down with no change in your current level of lighting. Low Glow: This phenomenon happens when you dim your lights all the way to off, but your bulbs still give off a faint glow of light. Flickering/Strobing/Flashing: Each of these is a slight variation of the others. Flickering occurs quickly and often, something you’ve probably seen in fluorescent tubes. Strobing is a slower, more rhythmic type of flickering but can be just as annoying and hurtful to your eyes. Flashing is considered more sporadic, with no real pattern. Before calling in professionals to address your LED dimmers, there are a few things you should consider that might help you locate the source of the issue. First, ask yourself if you bought dimmable LEDs. Not all LED bulbs are created to dim, and if installed with a dimmer, are likely to not respond well or at all. Secondly, not all dimming controls work with LEDs. If you installed LEDs and connected them to a dimmer for your previous incandescent lighting, it is likely they are not compatible. Third, are your LEDs a quality product? 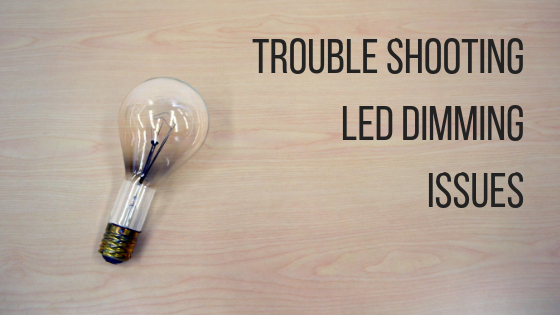 Not all LEDs are manufactured the same and a lack of quality could be to blame for dimming issues. You can read reviews online or talk to a local lighting consultant to learn more about the quality of certain LED brands. Lastly, be sure when installing to test the lighting before finishing the project. If you have issues right away, you can return the lights or control system and get a professional opinion. Sitler’s is a leading expert in LED products, including which bulbs dim and the best controls to install with them. Plus, Sitler’s works with a team of licensed, experienced electricians to install all of their projects. This professional approach ensures your dimming LED system will work from the beginning! You can view our products page here to find the best lighting for your space, and you can contact one of our lighting consultants by calling (319) 653-2123 to ask LED dimming questions!